This is a recipe from my new cookbook–Healthy Eating for Life–due out in early January 2014. It’s simple to do–no fuss and can be made anytime of year. I don’t as a rule eat dessert but when Meredith hands me a small bowl of this with a dollop of yogurt–I find it hard to resist. 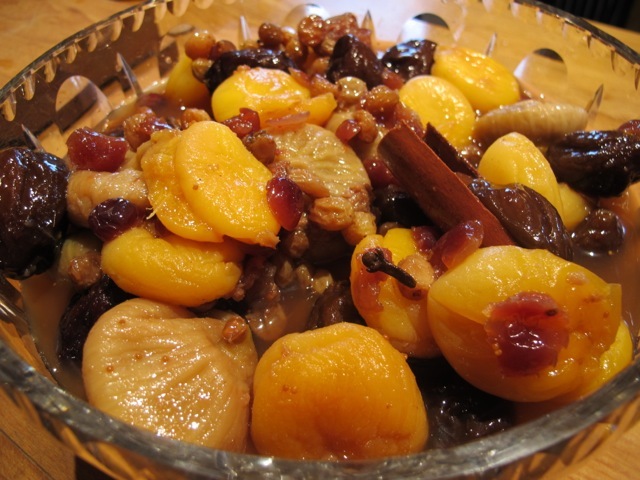 Yellow apricots lighten the colours but the darker untreated ones taste as good. These amounts can serve at least ten people but as it tastes even better the next day and the day after having sat in the fridge any left over will serve well over the following few days. Boil the water and pour it over the teabags in a china bowl—leave for 10 minutes. 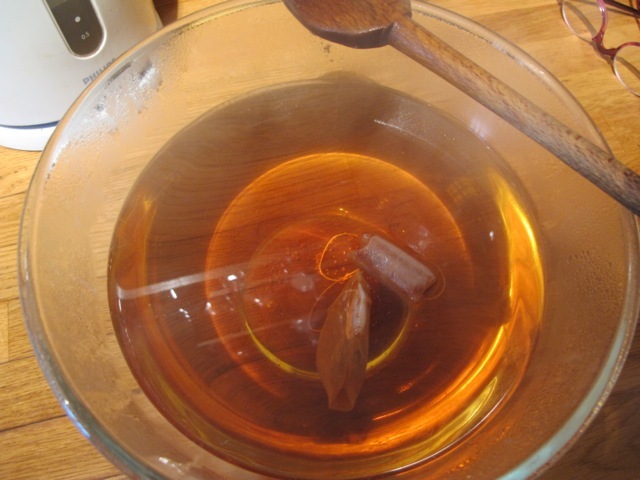 Remove the teabag and pour the liquid into a pan. 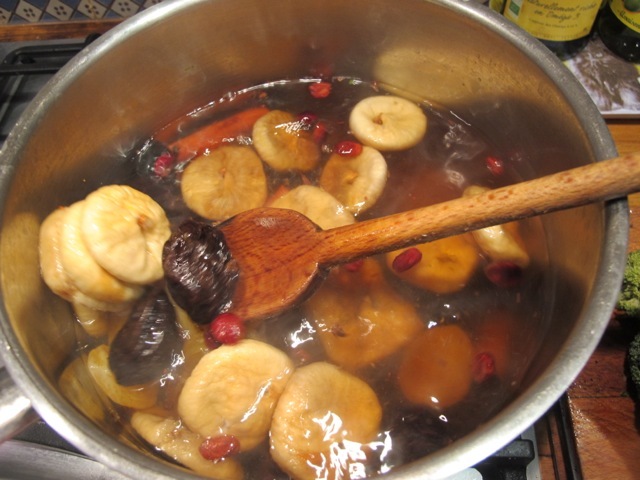 Add the dried fruit, cloves and cinnamon sticks and simmer 15 minutes. Serve with flaked almonds and yogurt or creme fraiche. This looks absolutely delicious, and easy for even a cook like me! I’m pretty sure you meant 350 gms dried figs, not 350 dried figs, right? Whoops!–thank Tunnza. 350 figs would be hard to swallow! Thanks for this – it’s an exciting new direction. I remember having some really good fruit compotes many years ago on a student exchange in the Russia of the Soviet era when they wouldn’t allow a fresh orange to be taken into the country. I meant to track down how to make them as they were delicious. I’ve always thought dried fruit was under appreciated and now it appears to be a very ecological way of eating exotics. 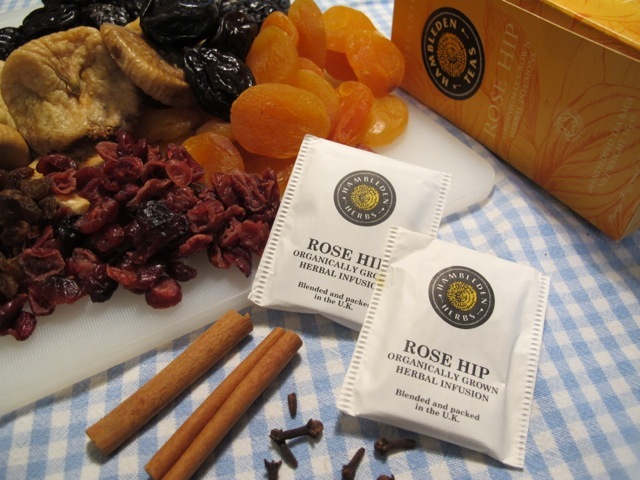 This looks good, and all fruit it must be good for you.One question Robin where do I get the Rose Hip tea bags.carn’t remember seeing them with the tea’s and coffee? Organic food shops are worth a try. Hi Robin. Letting you know I’ve linked to this article in my latest blog post. Thanks for the recipe. I’m off to buy the ingredients after work. I’ll be coming back to this one with great pleasure during the long Polish winter. all my favourite ingredients. Like Sheila Eva I find dried fruit compotes essential in this part of the world, but people tend to oversweeten them, whereas your recipe looks just right!. But for now we actually have fresh apricots! Yippee! A DESSERT recipe? Now there’s something I didn’t expect from you, Robin. I’ll have to try this!